Bollards are short, ground-mounted, outdoor light fixtures that are generally used to provide “cutoff illumination” for walkways, pathways and borders for lawns or other outdoor areas. They are commonly seen in rows between foot and vehicle areas, separated by a few feet to prevent cars from passing into the pedestrian area. 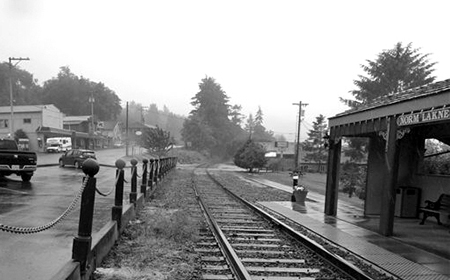 Our PolySteel® bollard is a reproduction of the wharf posts historically found in many U.S. seaports in the early 1900s. Our lighted bollard makes a handsome driveway or commercial entrance marker and an elegant accouterment for pathway, courtyard or garden lighting. TerraCast®’s line of bollards is made with the same method we use to build our PolySteel® light poles. Our composite light poles start with a galvanized steel core, encased in a layer of polyurethane foam, which creates the size and basic shape, fluting, and tapering. They finish with a quarter inch thick layer of our Linear Low Density Polyethylene, or LLDPE, Resin. Just like their larger counterparts, our Bollards stand tall against the elements, although they are considerably smaller. Standard sizes are 36 to 42 inches, after installation. 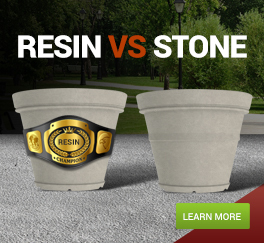 Because resin is non-porous and non-hydroscopic, it is completely water and airtight. The galvanized steel core is completely cut off from the elements inside the thick polyurethane foam. The outer layer is a quarter inch of impermeable resin, which seals around the other layers. The core is completely isolated and protected from the elements, preventing corrosion. This ensures a long life of enduring beauty. Our burial base bollards includes a 17” burial extension for easy in-ground installation and our others are mounted in one of two ways: Side Mount, Anchor Mount. Side Mount is used for blocking pathways while illuminating or protecting gutter, overhangs, curbing, side walls or dock areas. Anchor Mount is for use in paved areas where grounds are level and can support anchor bolts. In-Ground Burial Mount is used for lawn and open areas. TerraCast® uses LED lighting for all of our lighting products. LED bulbs are more cost effective, more energy efficient and last longer than other older-technology bulbs. Also, they don’t generate the same amount of heat as halogen or incandescent bulbs and they are completely customizable from lumen-output brightness to color temperature. For the Bollards, we typically use an A19 style light bulb inside a cast aluminum dome top and base plate, which are mounted on top of the PolySteel® Bollard. 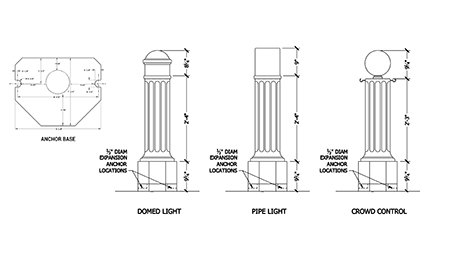 Our lighted bollards have three options for top styling, Pipe Top, Dome Aluminum Top, and Globe Top. The Pipe Top is a modern looking style, the column of the bollard continues up and the lighted column is virtually the same width and diameter of the bollard, creating a modern look. The Dome Aluminum Top incorporates cast aluminum parts accenting the illuminating dome, giving it a historical, wharf or waterside type look. The Globe Top is the simple sphere most often seen around public areas, mostly used for crowd control applications as a border to keep cars out of pedestrian areas, or to light the path for people promenading in the park. Currently, our most popular bollard is an in-ground burial base style bollard with the aluminum domed top. It is a PolySteel® lighting product, so the bulb it comes with is a long-lasting LED. These bollards are installed all over. Perhaps you’ve seen them. 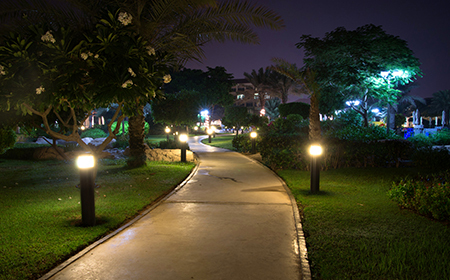 They’re frequently used for docks, arenas, sidewalks and pathways, even downtown areas for illuminating walkways with ambient lighting. The Low Linear Density Polyethylene we use to make our products is composed of recycled material and our darker colors are made from up to 100% post-consumer recycled materials. In an age when being Green is becoming the new standard to strive for, Terracast® has been “Green” for 30 years, using recycled, recyclable materials.